We have so, SO much more to announce. Calling you Vamps, Mariachi’s, Sharp Shooters, and Bay Area quality Freaks of all stripes. We’ll bring our high standard party faire we showcased at Phantasm with lots of only-in-SF performance, art, curiosities, spectacle and a dash of kink. Get your tickets now before they go up. 5 ACTIVATED Environments throughout Midway. + cafe open all night. **The patio opens at 5:00pm (Dusk!) for music, food, games and costume help, with some professional make up artists and face painters on hand to help you with your Halloween look. Live music and DJ’s for this portion, and if you come before 9:00pm you’ll get a wristband giving you in and our privileges at the venue all night which is good for you party hoppers. -Creepy and real bio specimens in jars on loan from the California Academy of Sciences! 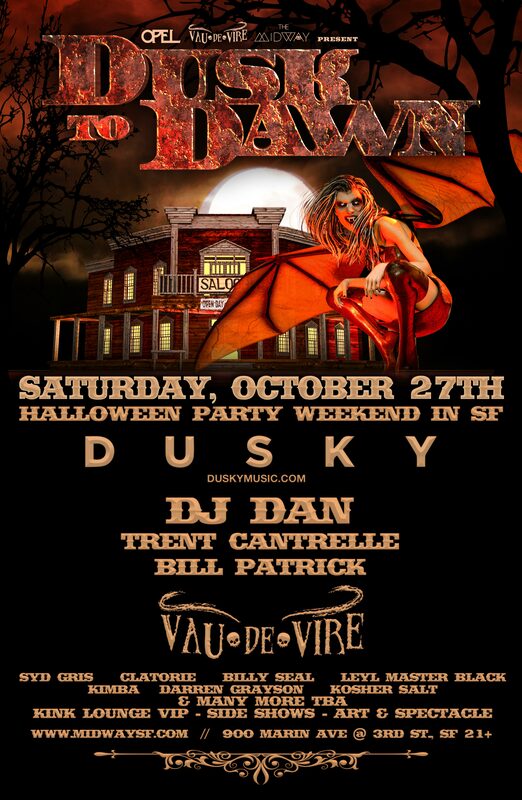 Dusk to Dawn is a new venture brought to you by Opel Productions & The Vau de Vire Society, the producers of Phantasm : Halloween at the Armory, one of the most raved about, diverse, eclectic, premiere Halloween parties in SF’s illustrious history. Alas, the Armory was sold to cultureless developers, and so we’re excited to partner with the Midway on this new joint in their awesome space to work our magic. Write us for volunteer opportunities.